God listens. God loves. They’re one in the same to Him. I could have died before receiving eternal life through Jesus, but God heard the many people who prayed for me and showed me mercy. I moved from the Midwest to California. I knew I’d come into a relationship with God. I had some friends through work and a few at my apartment complex, but I couldn’t get very close to people. I had an eating disorder. Eating disorders are very possessive—they don’t like to share. So I spent a lot of time alone. Even when I was with people I was alone. So I asked God to give me someone I could really talk to. I had a long-distance relationship. I got brave and told my boyfriend about my eating disorder. He never called again. Then I really was alone. I talked with my sisters who were Christians. They kept encouraging me. And I know they were praying for me. Every time I fell down and gave in to the eating disorder, I felt ashamed, like I’d let God down. I prayed that I would be set free. “Why, O Lord, do you stand far off? In my heart, I sensed that He wasn’t standing far off. It was I who was hiding from Him. I asked God to bring me together with someone who knew what it meant to know him. Even though I didn’t think I deserved it, and wondered if they would reject me. I knew trouble. I knew grief. I was a victim. I was fatherless. I asked God to bring me someone to listen and comfort and save me from the sadness and the shame. I moved to another town. I was alone. But not for long. God dumped me into a party of a couple dozen kids my age who were alive like no other kids I’d known. They were desperate to know more of Jesus. And they were incredibly kind to me. The eating disorder got in the way. My sadness got in the way. So I still had times of feeling alone. During those times God sent very special people to help me understand what it meant to be loved by God, unconditionally. And God showed me again and again that He was listening. I began to spend time in the Psalms. God showed me His heart. And I entrusted more and more of mine to Him. 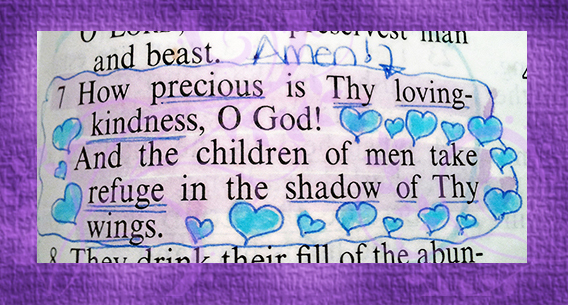 During that time, one word kept jumping out from the Psalms: Lovingkindness. God’s never failing kindness and mercy and tenderness. I turned to the Psalms early in the morning and late at night. I wrinkled the pages with my tears. God came near and heard my cries. God came near and covered my shame. God listened to this broken girl. God held this broken vessel. He heard. He loved. And He healed. Next Post Listening: Cumbered much?